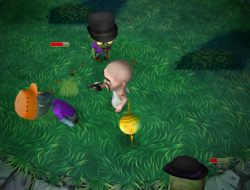 The zombies are on the loose and it is your main objective in this action game to protect the citizens of your town safe as tonight is Halloween. The main way you will destroy their race will be shooting them as fast as possible but remember to enjoy this holiday and collect all the candy on your missions. Help the scared men and women you meet as they are being chased as well by quite a few of the green monsters. They are slower then you but the numbers in their favor. Collect more powerful weapons and use your shockwave to spread them around. Use the arrow keys to move, ZX to attack. After Sunset 0.00 between 0 and 10 based on 0 votes.